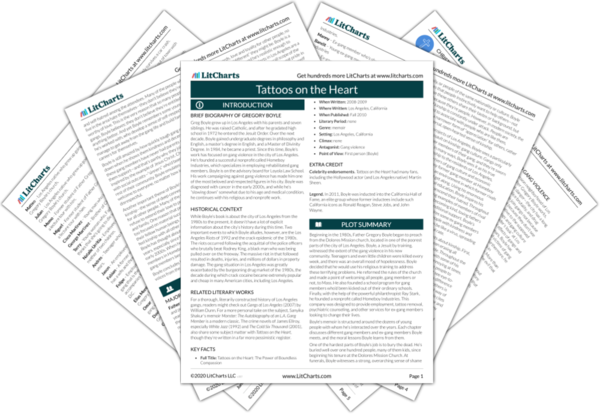 Instant downloads of all 942 LitChart PDFs (including Tattoos on the Heart). Father Gregory Boyle is the narrator and protagonist of Tattoos on the Heart. For more than thirty years, he has lived in Los Angeles, preaching from his church in the Dolores Mission and running Homeboy Industries, a nonprofit that specializes in helping ex-convicts find work. Boyle focuses his efforts on responding to the threat of gang violence in the impoverished parts of Los Angeles. Gang violence, he argues, makes people frightened, cruel, and unwilling to accept the unconditional love that is their birthright as human beings. Boyle nurtures close relationships with hundreds of youths, many of whom are guilty of serious crimes. Instead of judging his students, congregants, and employees, Boyle treats them with compassion and respect (as well as some occasional, well-timed sarcasm). In doing so, Boyle models his conviction that mankind’s purpose is to embrace kinship—in other words, love and loyalty for other people, no matter how superficially “different” they might be. Boyle is a talented community organizer, and he’s realistic enough to recognize that, while admirable, his efforts in Los Angeles are a mere drop in the bucket compared to the overall scope of the problem of gang violence. Nevertheless, he takes great pride in the good work that he’s done, and continues to devote himself to the doctrine of kinship even after he’s diagnosed with cancer. ). Note: all page numbers and citation info for the quotes below refer to the Free Press edition of Tattoos on the Heart published in 2011. Suddenly, the welcome mat was tentatively placed out front. A new sense of "church" had emerged, open and inclusive, replacing the hermetically sealed model that had kept the "good folks" in and the “bad folks" out. Unlock explanations and citation info for this and every other Tattoos on the Heart quote. Homeboy Industries can only hire and help a finite number of gang members. Though thousands have found assistance, it remains a tiny drop in a pretty deep bucket. In the city of Los Angeles, Homeboy Industries has operated as a symbol as much as a place of concrete help. For more than twenty years, it has asked this city "What if we were to invest in gang members, rather than just seek to incarcerate our way out of this problem?" "Damn, G," he shakes his head, "What's up with white people anyway?" I was actually curious as to what was up with us. "I don't know what is up with us?" "I mean, damn," he says, "They always be using the word GREAT.'" Our image of who God is and what's on God's mind is more tiny than it is troubled. It trips more on our puny sense of God than over conflicting creedal statements or theological considerations. There is a longing in us all to be God-enthralled. So enthralled that to those hunkered down in their disgrace, in the shadow of death, we become transparent messengers of God's own tender mercy. We want to be seized by that same tenderness; we want to bear the largeness of God. All throughout Scripture and history, the principal suffering of the poor is not that they can't pay their rent on time or that they are three dollars short of a package of Pampers. […] The principal suffering of the poor is shame and disgrace. It is a toxic shame—a global sense of failure of the whole self. Out of the wreck of our disfigured, misshapen selves, so darkened by shame and disgrace, indeed the Lord comes to us disguised as ourselves. And we don't grow into this—we just learn to pay better attention. To love the enemy and to find some spaciousness for the victimizer, as well as the victim, resembles more the expansive compassion of God. That's why you do it. This man sees all this and shakes his head, determined and disgusted, as if to say "tsk tsk." "You know," he says, "This used to be a church." They refuse to receive communion. I beg them. They will not budge. I go to the congregation and invite them to receive communion. Not one person comes forward. I beg and plead, but no one steps up. I discover later, with the help of some Jesuit scholastics, that the Indians' sense of cultural disparagement and toxic shame was total. Since the time of the Conquista, when the Spaniards “converted” the Indians, they baptized them, but no roofs ever got ripped open. This was to be their place—outside of communion—forever. Maybe we call this the opposite of God. I'm thinking, How does a sixteen-year-old get off thinking that she won't see eighteen? It is one of the explanations for teen pregnancies in the barrio. If you don't believe you will reach eighteen, then you accelerate the whole process, and you become a mother well before you're ready. "Damn, G, seventy-five?" He shakes his head in disbelief, his voice a bare hush now. "I mean, damn . . . when's it gonna end?" I reach down to Omar and go to shake his hand. We connect and I pull him to his feet. I hold his hand with both of mine and zero in on his eyes. "Mijo, it will end," I say, "the minute . . . you decide." "Tonight, you taught me that no amount of my wanting you to have a life is the same as you wanting to have one. Now, I can help you get a life—I just can’t give you the desire to want one. So, when you want a life, call me." And I walk away more than a little discouraged. I contemplate a career change—crossing guard perhaps. Some months later, Leo did call me. "It's time already," he says. I knew exactly what that meant. "Oh, come on now G, you know," he says, spinning his hand in a circular motion, "You're in my . . . jurisdiction." I can’t be entirely sure what Junior meant. Except for the fact that we all need to see that we are in each other's "jurisdictions," spheres of acceptance—only, all the time. And yet, there are lines that get drawn, and barriers erected, meant only to exclude. We seek to create loving communities of kinship precisely to counteract mounting lovelessness, racism, and the cultural disparagement that keeps us apart. Maybe there are eight of us or so when the meal finally gets served. Plenty to go around and just as tasty as it could be. Everyone brought his flavor to this forbidden pot of iguana stew and keeping anyone away and excluded was unthinkable to this band of prisoners. Alone, they didn't have much, but together, they had a potful of plenty. 'THE LORD IS NOTHING I SHALL WANT." There is enough strained obligation in what we think God asks of us that our mantra might as well be "The Lord is nothing I shall want." But the task at hand is only about delighting—with joy at the center. At ease. We can all relax. Are you, in the end, successful? Naturally, I find myself heartened by Mother Teresa's take: "We are not called to be successful, but faithful." This distinction is helpful for me as I barricade myself against the daily dread of setback. The Left was equally annoyed. They wanted to see the ten-point plan, the revolution in high gear, the toppling of sinful social structures. They were impatient with His brand of solidarity. They wanted to see Him taking the right stand on issues, not just standing in the right place. But Jesus just stood with the outcast. The Left screamed: "Don't just stand there, do something." Bandit hangs back. "Can I tell you something, dog?" I ask, standing in the parking lot. "I give you credit for the man you've chosen to become. I'm proud of you." "Sabes qué?" he says, eyes watering, "I'm proud of myself. All my life, people called me a lowlife, a bueno para nada. I guess I showed 'em." "For the first time in the history of this country three gang members walked into the White House. We had dinner there . . . I told her the food tasted nasty." He pauses and gets still. And she cried. Well, mijo, whaddya 'spect? She just caught a glimpse of ya. She saw that you are somebody. She recognized you . . . as the shape of God's heart. Sometimes people cry when they see that. But who wouldn't be proud to claim Chico as their own? His soul feeling its worth before its leaving. The mortician's incredulity reminds me that kinship remains elusive. Its absence asserts that any effort to help someone like Chico just might be a waste of our collective time. Get the entire Tattoos on the Heart LitChart as a printable PDF. The timeline below shows where the character Father Gregory Boyle appears in Tattoos on the Heart. The colored dots and icons indicate which themes are associated with that appearance. Arn, Jackson. "Tattoos on the Heart Characters: Father Gregory Boyle." LitCharts. LitCharts LLC, 17 Aug 2017. Web. 18 Apr 2019. Arn, Jackson. "Tattoos on the Heart Characters: Father Gregory Boyle." LitCharts LLC, August 17, 2017. Retrieved April 18, 2019. https://www.litcharts.com/lit/tattoos-on-the-heart/characters/father-gregory-boyle.